If you scout a team, it is usually easy to spot the biggest offensive threat. Many coaches will then design various defensive schemes to try to limit that one player’s offensive impact. I asked Coach Passmore about solutions for junk defenses that are designed around limiting one player. Coach Passmore offered five different solutions. Sub out the player receiving extra attention. Have Key Player Set Screens. Pressure release for back door. Go 4 out 1 in. Depending on the other personnel, playing four on four could be the easiest solution. Let’s say the defense plays full denial and gives no help off of the best offensive player. That will allow for more space for the other four offensive players to operate. Even if there is only one favorable matchup in that scenario, the limited help available will put the defense in a tough position to get stops. When Coach Passmore suggested this solution for junk defenses, my first instinct was to dismiss it. Getting the player out of the game meant the defense won. Obviously, it seems to play right into their hands to take that player out, but remember the defense probably spent two days talking about one player if they are in a full denial defense. When the player is not in the game, the defense might struggle to adjust mentally and physically. Then when the player is reinserted, it could again cause confusion as players struggle to readjust. Taking the person that is getting extra attention and making that player set a ball screen is especially hard on switching defenses. If the other three defensive players are put in positions on the court that make it harder for them to help, it can lead to the player coming off the ball screen getting great looks. This is just a basic set where two is the one being denied. The two could take a step or two to the ball or just play dead until five flashes up and vacates the backdoor. The five must throw the pass immediately after receiving the ball (click pass). This offense was the one that Coach Passmore seemed to like the most versus junk defenses. The person that received extra attention should be the one who ends up playing inside. Second, the best offensive player will be harder for the other four offensive players to ignore by playing inside since they are always one pass away. Players with lower I.Q. might not recognize the importance of getting a key player touches. If that player is being denied, the other four players might take the path of least resistance and ignore their greatest offensive scoring threat. There is a reason that great scorers lead the team in scoring every night even when the opposition puts a target on their back. 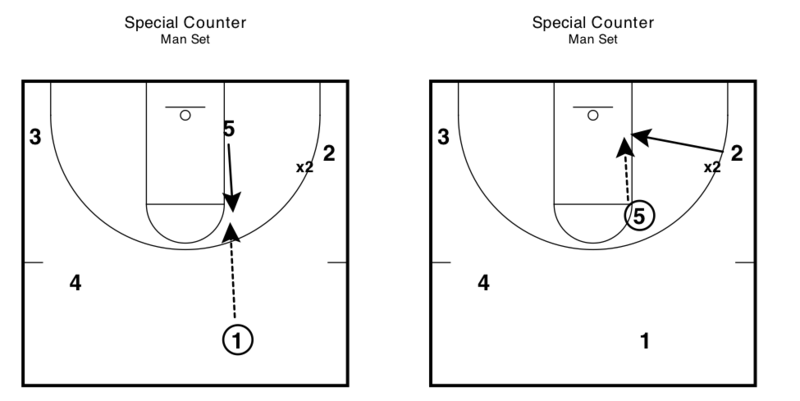 Third, it is a logical spot in an offense to be an active screener. As mentioned above a defense will have trouble switching. Fourth, even if it is a guard that is playing inside they will have an advantage. Providing that they have one post move to score on, the player covering them will probably have next to zero experience playing post defense. Defensively, guards are much more comfortable on the perimeter.